I’ve found my new method of cooking brisket and its “Old School”!! 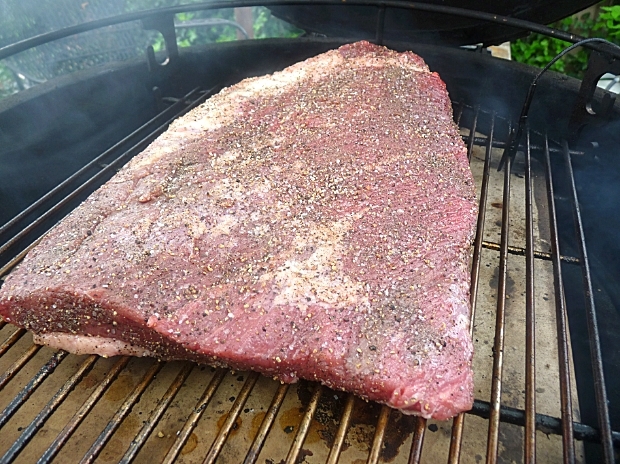 If you’ve listened to bbqers talk brisket, or read any bbq forums, you’ve probably found out there are a ton of ways to tackle this troublesome hunk of cow. Low and slow or turbo? Wrap during the cook or leave alone? If you wrap, aluminum foil or butcher paper? Inject? Marinate? What kind of rub? What type of wood for smoke? Sauce or no sauce? (Personally, I prefer not to have sauce on my brisket, maybe some on the side. Make sure to check out the sauce recipe at the end of the post if you must have sauce). So many ways to approach it, it could make your head spin. What’s a fella’ to do? My Doc recently told me that if I was to eat beef, it should be 100% grass fed. Seems that most beef is fattened up the last few weeks of their life on corn. Basically, they are turned into diabetic cows. It does something to the meat, something to do with changing the amino acids. Or something. I can’t quite remember. What I did get out of it is that it’s not good to feed diabetic meat to a diabetic…or anybody for that matter, but I’ll let you decide what’s right for you. So following the Doc’s orders, last weekend we went down to the Dallas Farmer’s Market in order to procure ourselves a 100% grass fed brisket from North Star Ranch. We’ve cooked a brisket from them, but it was years ago. Their briskets tend to run on the small size. This one was 5.46lbs. And yes it was a full packer. I know most full packers run in the 12-14lb range, some going down to 10lbs others going up as high as 18lbs. I believe it has something to do with being grass fed and that they slaughter them younger and smaller. Whatever the reason maybe, they are excellent briskets and 5.46lbs is more reasonable for two people anyway. Brisket ready to be trimmed. 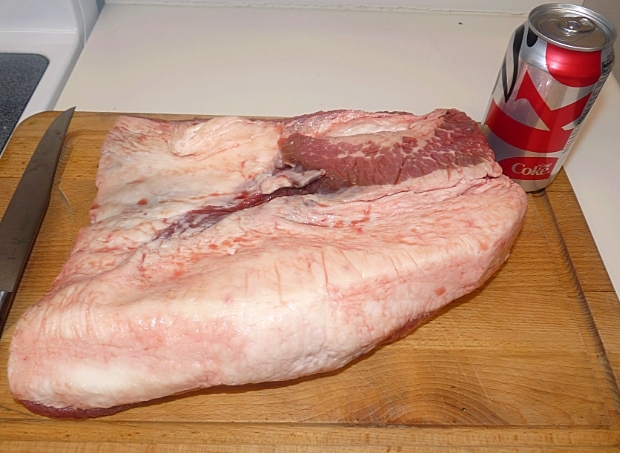 I “borrowed” one of my wife’s Diet Cokes to give you a size comparison of this brisket. 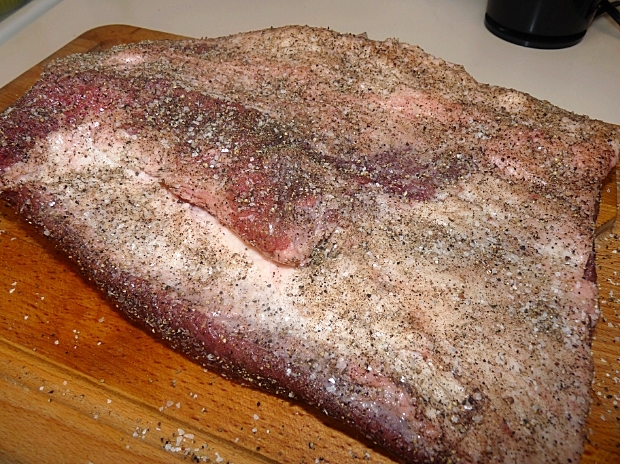 The brisket has been trimmed and rubbed down with salt and pepper. I’ve cooked brisket many a ways in the past. I was thinking about how I wanted to tackle this particular one and it came to me. Why not go back to the basics? Why not go old school? Nothing fancy, no special rubs, no mustard slather, no wrapping it during the cook. No, this was going to be plain Jane, good ole fashioned brisket. Nothing but a 50/50 mix of kosher salt and fresh ground black pepper. The inspiration came from watching some videos of Aaron Franklin online last week. If you haven’t heard of Aaron Franklin, he’s a relatively new up and comer in the bbq world and the briskets he has been putting out at Franklin’s in Austin have been touted as the best in the world. Don’t believe me? Go check it out. Watching his videos, I learned that all he puts on his briskets is salt and pepper. If that is good enough for him and good enough to be called the best, well then is certainly is worth me giving it a shot. The BGE coming up to temperature. Look at that smoke pouring out of the Egg. Think its time I replace the gasket on it? Part of that is due to the fact that I was using a pit controller and the fan was whirring away trying to bring the Egg up to temperature. Still…that’s more than a little leak. 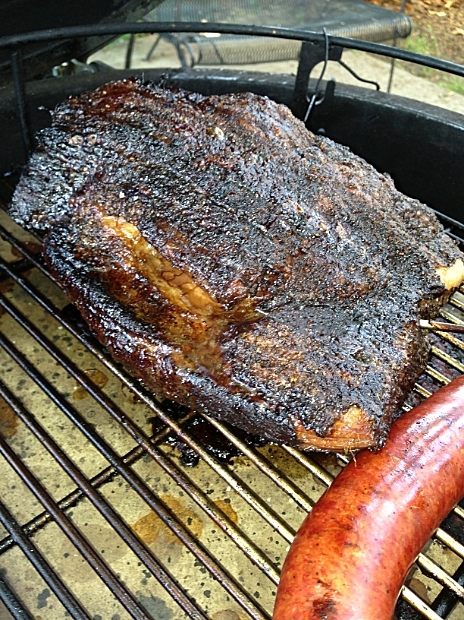 By the way, for smoke we used a combination of mesquite wood chips and pecan and hickory chunks. I wanted to use strictly mesquite but come the morning of the cook I realized I had no mesquite chunks and chips by themselves just wouldn’t cut it. Brisket on the Egg at 11am. I took this picture for me. Sort of a reference of which way the grain was running. Sometimes it can be hard to tell after the cook and the bark has formed. When slicing a brisket, you want to cut it against the grain. On this particular one, you can tell the grain is running from the bottom left corner to the top right corner (///). So when you slice it, you would want to slice it like this: \\\. At least on the flat, the grain usually changes direction when you come to the point. Sausage added near the end of the cook. Continuing on with the “Old School” theme, for this cook I went with 250F at grate level for my temperature. I wasn’t real sure how long it would take. Generally, the rule of thumb is between an hour and an hour and a half per pound. I wasn’t real sure if that applied to grass feed beef as well, but we didn’t have any plans for the day. 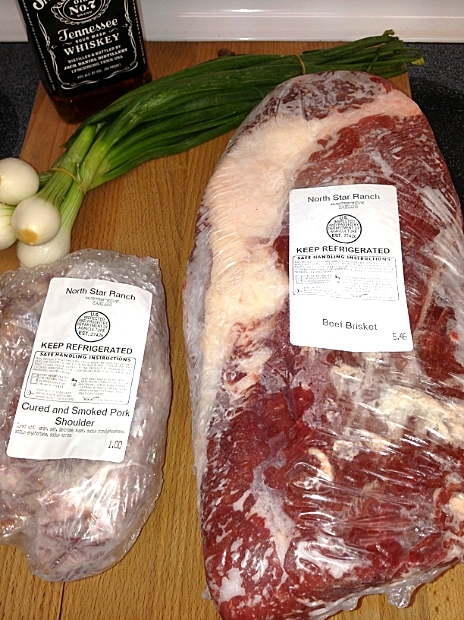 Bbq, and especially brisket, is ready when its ready. You can’t rush it. It would either be done in 5.46 hours, or it would be done in 8.19. The nice thing about the BGE is that it really needs no monitoring once it has stabilized. I was able to mow the yard, do some yard work. I even went up to the Richardson Farmer’s Market and the pharmacy while this was cooking. Try doing that with an offset smoker. This particular brisket went on at 11am. We finally pulled it once it had reached 196F and a toothpick slid in like butter with no resistance at 6:30pm. Seven and half hours later. Not too shabby. An easily managed cook. So first thing you want to do is cut into it, right? Wrong!! Just like a steak, if you cut into it now, all the juice is going to run out leaving you with a dry hunk of meat. You have two options instead. Either loosely tent it with foil for 30 minutes, or go with the “FTC” method. Foil, towels, cooler. What this means is wrap your brisket in heavy duty aluminum foil. Take a small cooler and line the bottom with towels. Make sure they aren’t the good guest towels, or you might find yourself sleeping on the couch. 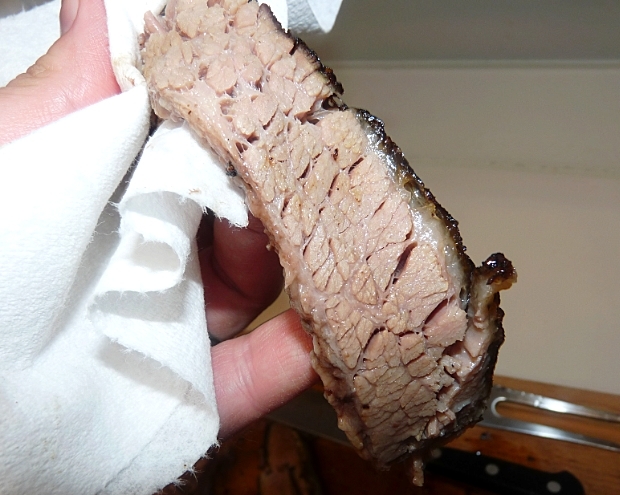 Place the wrapped brisket in the towel lined cooler and then add more towels to fill it up. If you do this method, you can hold your brisket for as little as 30 minutes up to 4 hours and it will still be steaming hot. This is a slice from the flat. 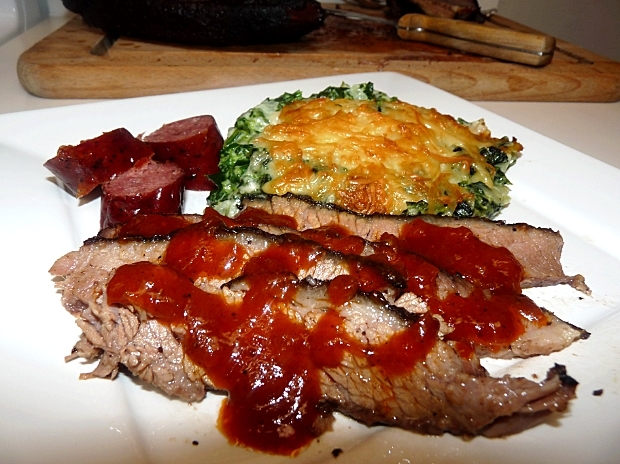 It is the leaner portion of the brisket and does not contain as much fat. This is a slice from the point. Even after being in a cooler for 30 minutes, it was so hot that I couldn’t hold it and snap a picture without a paper towel. You’ll notice that it is juicier and has a different texture. 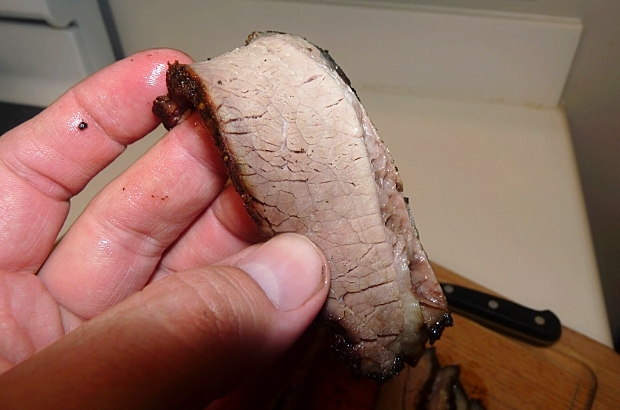 To me, the point is the best part of a brisket. In fact, if I could get just the point, I don’t think I would ever cook a full packer. Smoked brisket! In my mind the perfect meal. We served it up with some boracho beans (drunk beans), creamed spinach and the sausage. Heavenly. Even though we did not achieve the desired smoke ring (I’m still scratching my head trying to figure out that one), this brisket came out great. Not under cooked where it would be tough, not over cooked where it would fall apart, but perfectly fork tender. 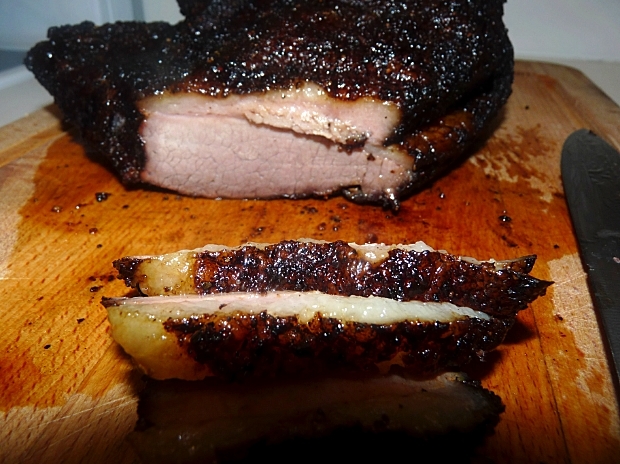 Great smoke flavor and to be quite honest…the plain 50/50% salt and pepper rub was outstanding. A great flavor that did not compete with the taste of the meat, but complimented it perfectly. I don’t think I will ever use another rub on a brisket again, just salt and pepper. As for the sauce, it wasn’t needed at all, but once I got done doctoring it up, it was wonderful. A velvety, buttery feel and taste to it, with a hint of smoke (I added in the liquid that accumulated in the foil while it was wrapped) and just a bit of heat. Try Aaron Franklin’s sauce how he explained it on a YouTube video, but feel free to adapt it to your taste palate. Melt butter and saute onions until soft and translucent. Add remaining ingredients and bring to a boil, reduce heat and simmer for 30 minutes. 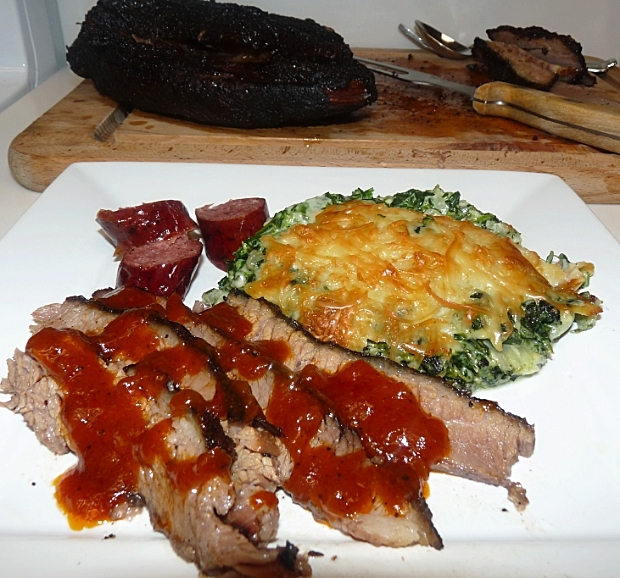 We found his sauce to be on the sweet side, so we added in some drippings from the brisket, Frank’s Hot Sauce, more black pepper, some red pepper flakes, ancho and chipotle powder. Feel free to adjust to suit your tastes. Next time, I think I’ll cut back on the butter as well. Great looking brisket! I really enjoy your site — lots of helpful tips and the pictures that go along with the steps are excellent. It’s a nice coincidence that I’m looking for a good creamed spinach recipe. How did you make this one? I’ll have to get back with you on that one after I talk to my wife. She made it. All I can say is that it had spinach, cream, fresh grated parmesan cheese and was topped with a smoked Gruyere. There’s more, but I don’t know what. It was Ina Garten’s recip on foodnetwork.com. Spinach Gratin. Very tasty! Well there ya go. Thanks, Honey. Thanks! I’ll definitely give that one a try. Looks great! I’ve got to give brisket a try again. I usually just turn it into pastrami. You are so right about the way the Egg holds temperature. It’s uncanny sometimes ;). Love the new site template, Jason! I think I may finally be ready to tackle brisket. Do you think I need to invest in a pit controller? No, its not necessary. If you are comfortable building and stabilizing your Egg, there is no reason to have one other than convenience and piece of mind. I had my Egg a long time before I got one. Did plenty of overnighters and never had a fire go out. Did you put the brisket on after the white smoke went away? If not, that might be the reason why you didn’t have a ring. I have found that putting meat on after the white smoke gives you what you were looking for. Learned it from Thirdeye. Love the new look! And I can not wait for the day when I have a yard to put a green egg in! Jason, that looks like a mighty fine job was done on that Brisket!!! I have a couple in my freezer I have been saving for that perfect weekend, but have been too busy lately. I have to admit, I am not a great brisket cook. I have tried them 3 or 4 times, only once on the Big Green Egg and my first one was horrible, the second and third were better because I ended up braising them to get them tender enough in the end (did those 3 on a gasser indirectly) and the last one was done on the Egg, but I didn’t have an internal meat probe then, so I was going by time, not temp. I imagine I would do MUCH better now!!! However, I am never sure how long to cook them, if I should start them over night or early in the AM. 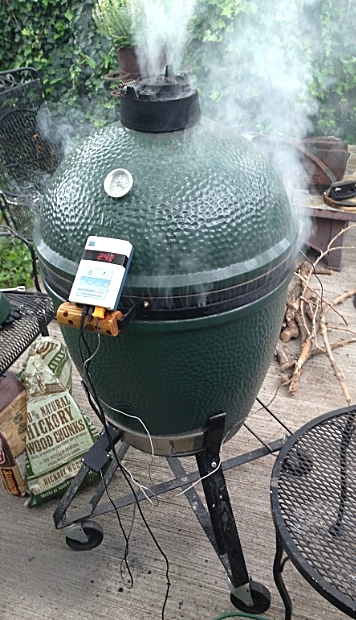 I am going to try this method next time (I am adding this link to my EGGing Bucket List) and now that I know how to use my DigiQ II, it should keep it riding at a solid 250F all day and it will give me the internal temp as well. Brian, I always shoot for somewhere around an hour to an hour and half per pound when doing briskets (this one was 1.34 hours per pound), but the best way to tell is when a probe (or toothpick) slides in like butter with no resistance. This one was done at 196, but I’ve had them done anywhere between 190 and 205. Every brisket will cook differently. You can always use the foil, towel, cooler method if it gets done early and hold it up to 4 hours. Hmmm…I have no idea why that is. I’m still seeing you in mine. FB does weird things sometimes. That is the smallest brisket I’ve seen too. I think you might be onto something about why. I’m touring a cattle ranch in Montana the first week of June, I’ll ask about that. I don’t get a lot of smoke ring on my briskets either. Looks delicious! 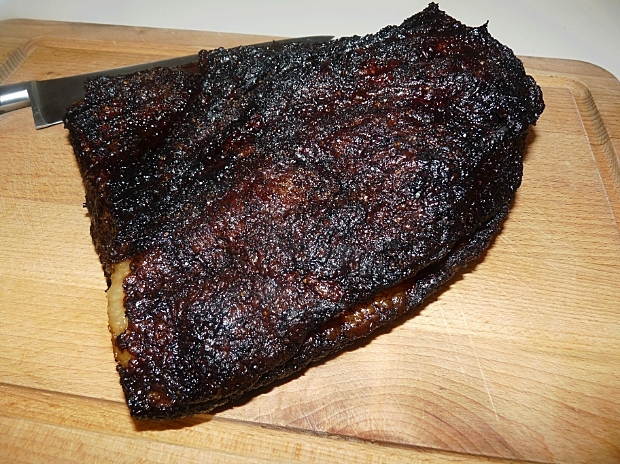 My husband’s recipe for brisket is always a hit and involved smoking on the Egg on day one and then cooking all night long in the oven at 200 degrees. It seems like a lot of time and effort to me but the results are excellent. How did the grass fed beef compare to regular? Could you tell the difference? Not much on flavor, but it was super tender. Jason, that looks freaking amazing. And I love that you have an appliance called the Big Green Egg. I don’t think they exist in Australia… but I might just attempt to import one if it cooks meat as good as that! Love the look of your wife’s creamed spinach gratin also. Perfect meal! I have heard of people having Big Green Eggs down under. If not, there are other brands that might be available. Kamado Joe for one and Chargriller has a version now. Just look up Kamado style grills and see what you find. I’ll tell my wife about your kind comment on her spinach. It was heavenly. Ah, will do. I’ve never been to a specialist BBQ store before but there’s this weird trend here (where I live in Western Australia) for people to buy super-humungous barbecues with a spit roasting attachment, gas burners, a giant hood, keep-warm-section, fridge and freezer (okay, now I’m exaggerating but they’re like giant outdoor kitchens). Every time my friends upgrade it’s a bigger monstrosity. Not to say that they’re not great to own, I’m sure they’re really useful… but it’s the same trend as giant televisions methinks! 🙂 I’d rather have a BGE. Or a small green egg, if they have one. We have a tiny apartment! Fridge and freezer? Awesome. Now I want one. BGE has a few sizes. There is a Mini (which we have), small, medium, large (this is our big one), Xl and now an XXL that is supposed to be huge. I think I read that you can cook a whole small pig. Are you sure about Aaron’s sauce recipe? I have found another recipe that claims to be his sauce and it is totally different. I live in Austin and can go by his place, if needed. Not sure if it’s the same one he uses at his restaurant, but it’s the one he gives out on one of his YouTube videos. No comment, just a question. How much charcoal did you use in the egg. I’m new on the egg and made a brisket on it about 2 months ago. Late in the cook I noticed my temp dripping even with the vent offended all the way. Come to find out, I had completely burned through all the coals and ended up having to yank the grate, water pan, and plate setter to add more coals. I’m making another Monday and don’t want to make the same mistake. Advice? No problem. That’s what we’re here for. To answer questions. I usually fill mine about 1/2 way to 3/4 of the way up the fire ring. So I ended up with THE best brisket a lot off my friends had ever tasted. I mean a 13lb brisket was gone in ten minutes. Somehow though, I could not control the temp. I had the egg down in the 240 range for a few hours then in spiked to 300. I ended up taking everything down again and removing my wood which still didn’t work. I finally just took it off after about 6 hours and used the oven for about 3 more hours until I noticed the internal temp on a steady decline after 190 and figured the meat was shrinking. Abby pointers on fire control? I had the egg almost completely closed and still burned way hot. Followed your “old school” brisket recipe exactly and even had a similar size brisket. The only thing I noticed was that the flat was dryer than the point. From a size perspective I guess that makes sense since it was a little thinner on my cut of meat. Probably 3 inches on the point area and 2 inches thick on the flat area. I had really good flavor, a nice smoke ring and some good bark…but the flat section was definitely dryer. Any tips or recommendations? You have some great recipes by the way…been using a lot of them. Thanks, Scott. The flat can turn out dryer than the point due to lack of fat. One thing you can do is pull the brisket when the flat is done, separate the point and throw that back on to cook longer.